How to treat fungal nails? If you have a fungal toenail problem, don’t be embarrassed. Get help from the highly-qualified podiatrists at My FootDr who can recommend the best treatment for you including fungal nail laser treatment. To treat a problem, a professional must identify and diagnose the problem. You need a dentist to fix and maintain your teeth like you need a Podiatrist to care for your feet! Step one to treating fungal nails is to seek professional assistance from a Podiatrist, who can tailor a solution to your individual condition and provide you with the very best results. When looking for the best treatment it is important to look at the advantages and disadvantages of all treatment options to determine which is best suited for you. The advice of a Podiatrist will provide you with educated and informed treatment options. This is a major advancement in the treatment of onychomycosis. The laser lights is used to penetrate the skin and nail plate to destroy the fungus without damaging the nail or skin itself. The procedure is generally pain-free and there are no side effects. 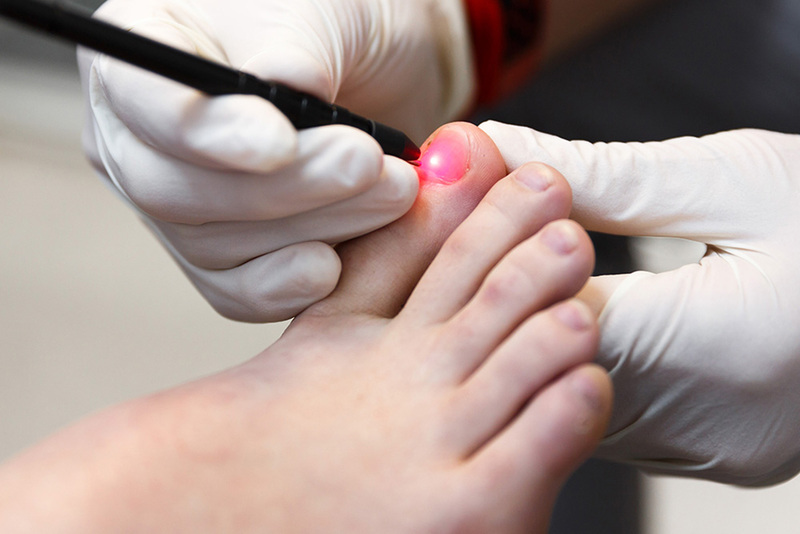 My FootDr Podiatrists treat fungal nails with revolutionary fungal nail laser treatment. Laser treatment easily penetrates the nail and generates heat at the site of infection beneath the nail plate. The fungal cells are destroyed before your healthy cells are damaged meaning laser therapy is pain-free. All you will feel is a warm sensation on the nail and nail bed. With an 80% success rate, laser treatment is the most successful option for patients suffering from fungal nails. In our Perth podiatry clinics, we use lunula cold laser therapy for the treatment of fungal nails. This treatment is the latest in cold laser technology and is a painless, fast and highly effective treatment for fungal nail infections. Our cold laser therapy treatment is available at My FootDr Currambine (formerly Preston Podiatry) and My FootDr West Perth. A medication is taken orally, generally for 6-12 weeks as liver toxicity can occur with prolonged use. To have these medications covered under the pharmaceutical benefits scheme, a study of your nail cutting is required to confirm that a dermatophyte or yeast infection is present. Some of the side effects include upset stomach, headaches, nausea and muscle pain. Advantages: Oral medication has a better efficacy in the treatment of fungal nails in comparison to topical preparations. The treatment plan is a short term of 12 weeks. Disadvantages: Common side effects include stomach upset, headache, nausea, taste disturbances and muscle pain. The treatment requires monthly blood tests to assess liver function by your GP. The treatment may be inappropriate due to the numerous drug-drug interactions. Alternative Treatments: There are several alternative treatments for fungal nails such as vapour rub. There is no research to support the success of these treatment options. Alternative treatments are not recommended by podiatrists. A medicated nail lacquer is applied to the nails daily for a long period. There are typically no side effects, although you must take care to avoid application to the adjacent skin as this can cause irritation. Applications of topical agents is quite a laborious task. Advantages: The topical preparations are painless, cost-effective, can be performed at home, and there are no real side effects. Disadvantages: The treatment can take up to 12 months or longer to take effect as it insufficiently penetrates nail plates. The treatment requires daily application. The treatment cannot be used during pregnancy or breastfeeding. Fighting a fungal infection requires proper diagnosis and treatment. Seeking professional assistance is the first step in effective treatment. To prevent infection, keep your feet clean, maintenance regular nail care and follow your Podiatrist recommended treatment plans. To find out more visit your local Podiatrist by booking an appointment online or call 1800 FOOTDR. Does this laser treatment work on fingernails too? Would you do fingernails? My elderly mother would benefit hugely. 2. Are all nails treated or just those infected.? 3. How long does the treatment take? 4. Is treatment covered by top A.H.M. Health Insurance?